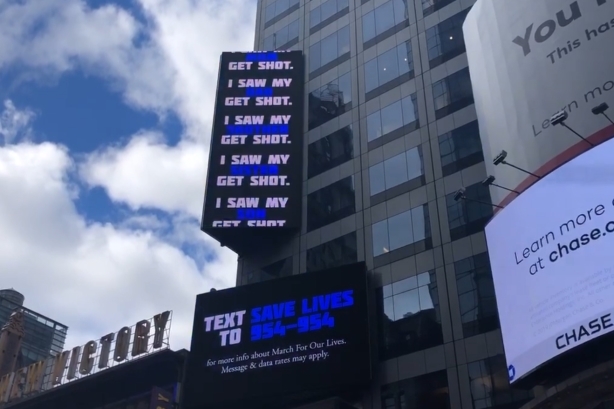 March For Our Lives, the student activist group formed after the mass shooting last year at Marjory Stoneman Douglas High School, started running hard-hitting digital billboards in Times Square this week. The main message, in reference to the nation’s gun violence epidemic: "Enough. We want change." The billboards will run through the end of the month and are expected to reach five-and-a-half million people. Brendan Duff, who cofounded March for Our Lives, explained the group's next steps in an op-ed on Monday to engage the public and to keep the gun violence prevention movement front and center.